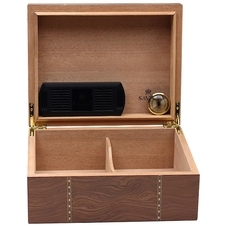 Savoy's medium-sized humidors offer a perfect middle ground between capacity and ease of keeping at hand. They're still compact enough to be kept on top of a larger desk, and more than easily fit onto a common bookshelf, all while storing a full fifty cigars. Construction is of solid, tightly-joined cedar, with brass hardware and highly polished, genuine wood veneer exteriors. This model features an exterior dressed in the beautiful, flowing grain of Ironwood, a type of hardwood which gets its name on the merit of its exceptional hardness and density, accented by both twin bands of marquetry inlay and mahogany edge-work along the top of the lid. Measurements: H 5" L 11 3/4" D 9 1/2"